IRONDALE, Ala., Oct. 26, 2016 /PRNewswire/ — At 8 p.m. 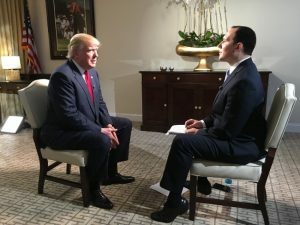 ET, Thursday, Oct. 27, EWTN’s “The World Over” with Host Raymond Arroyo will air an exclusive interview with Republican Presidential candidate Donald Trump, which will be of interest to people across the United States. Raymond Arroyo is a class act among journalist! He is the poster child or what a journalist should be and how to act. God Bless EWTN and the Catholic Faith for having someone like Mr. Arroyo. As a retired police sergeant, I was looking for signs of lying by Trump. I saw none. In the vast majority of people, when they are accessing memory, their eyes go up and to the right; when they are accessing creativity (i.e., lying) their eyes go up and to the left. For a small percentage of people, it is the opposite. When a police officer is interviewing someone, he will start by asking a question he is pretty sure the person knows the answer to, like Raymond Arroyo’s first questions to Trump about his mother. Trump’s eyes went up and to the right. His eyes went up and to the right many times during the interview. I did not see his eyes going up and to the left at all. Next post: Congratulations to Marcus Grodi and Journey Home for 20 Years!